At Ilam Florist, we understand the magic of flowers. Whether it’s a romantic red rose to show your love, or a beautiful bouquet, or a colourful posy to lift someone’s spirits, we know that flowers have the power to create special moments that will last a lifetime. Weekdays: Christchurch City cut off 2pm, rural 11am. All our florists are professionally trained to create floral arrangements with the Wow! factor. Our flowers are picked fresh daily. We guarantee their quality and freshness 100%. This commitment to quality has helped us stand out among other florist delivery services in Christchurch. It’s a promise that shows in every flower we sell. And some great gifts, too! We also have a fabulous selection of gifts such as chocolates and fudge, toys, plants – or you can send a beautiful gift basket with a combination of flowers and gifts for any occasion. We pride ourselves on providing you with the best floral experience, whether its a bouquet for the house or planning your wedding, we also can provide corporate work for your office or place of business. We have a huge range of flowers & floral arrangements for you to choose from. We offer friendly, helpful advice and are only too happy to take an extra bit of time to make sure you get the right flower arrangement, gift or present. We also have experience in providing a wedding planning service, so feel free to contact us to get a guide to how we can help you to arrange the special day. 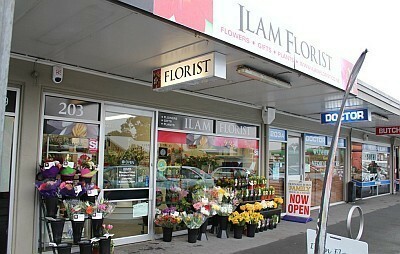 You are welcome to call us on +64 3 358 5396 or email jane@ilamflorist.co.nz.